I'm really enjoying my time as a member of the Angry Robot Army - the reviewer program of Angry Robot Books. It has helped me learn more about new authors that I might not have encountered on my own. Plus free books! Who can say no to free books? Now I had a very good feeling about The Lives of Tao when I first read the synopsis. The book had an interesting enough premise to make me want to download the book. I can be shallow enough to say that the cover seemed interesting too. It has a lot of yellow! Yellow is a good color! Yellow is the safe color. So I took the dive and signed up for the book and had it sent off to my Kindle. Admittedly it had to wait around a bit since I was still working through a number of other books first (as is the burden of any other avid read and independent blogger) but then things came together and here we are. And after finally reading A Feast for Crows, I needed a book that might cheer me up a bit more or at least get me engaged in a happier manner. And this was the perfect book for that purpose. 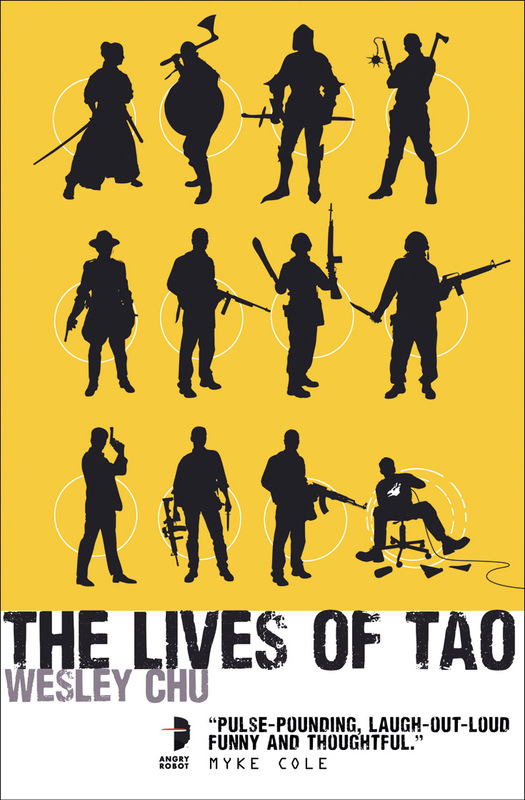 Synopsis: The Lives of Tao is the debut science fiction novel by one-time Hanes commercial model (of a sort) Wesley Chu. His experience as a martial artist and perhaps as an IT professional certainly helped shape this rather inventive little book. The main premise behind the book involves an alien race known as the Quasings - a sort of symbiotic race that ended up on prehistoric Earth by accident. They cannot survive in their natural forms and must inhabit living hosts in order to survive. They're very long-lived as long as they have a host body to inhabit - and thus they have survived on Earth over the centuries. The host body gains nothing but the benefit of the experience and insights of the Quasing inside him and that's about it. Fast-forward to the present day and we have one Roen Tan, an overweight IT guy who practically hates his life - you know the type. By accident, he becomes the next host for the Prophus Quasing known as Tao - an entity that has lives many lives including famous figures like Genghis Khan. Once joined, a Quasing can only leave his host when the host dies, and thus Tao is now stuck with Roen and vice versa. But time will run out quickly - the Prophus have been engaged in a centuries-long conflict with a rival Quasing faction known as the Genjix. And whether Roen is truly willing or not, he is now part of this war by virtue of Tao. If you read up on the author, Wesley Chu, you'll realize that he has rather diverse interests - many of which shaped the unique balance of this book. One that quickly comes to light is the fact that he's fairly into history - something anyone should be able to determine just by reading the book. Chapters start with snippets of Tao's past and thus we are get to catch glimpses of his former hosts and their successes and failures over the generations. And those different events tie directly into his current demeanor and his overall motivations. In addition, Chu's experience as a martial artist / stunt man / actor also contribute to some pretty intense fight sequences. I did mention that the Prophus and the Genjix are engaged in a way - but it's a secret one that they try to hide from the rest of humanity. And thus a lot of the action plays out like classic spy movies with agents fighting one another using guns, blades and their bare hands - whichever is most appropriate. And remember that no one gets any special powers - it's all about human-level physical training and skill. That certainly makes for an interesting constraint and some great combat. The book as a rather nice light, comedic tone for the most part - it reflects the demeanor of our protagonist Roen. Naturally he goes through different phases of accepting the fact that there's an alien inside him - a lot of which he deflects with humor. And the humor doesn't feel overly forced - it's not going to win comedy awards, but it feels natural enough to just flow with the story. So you get the rich background story born of centuries of history. You also get great fight scenes. And lastly you get rather complex characters who feel rather real and have some serious objectives that they need to achieve. Don't let the humor fool you - there is a greater conflict on-going and Roen together with Tao are but one cog in a larger machine. The book is a classic setup piece - based on the premise you know that Tao and the Prophus will need to get Roen back into shape and properly trained to fight the Genjix And we also know that there's a lot more Tao than is initially apparent and that's a fun little mystery to unravel. And of course there's the Quasing story as a whole and why they continue to fight one another with all of humanity their unwitting instruments in their manipulations. So yes, this book perfectly primes things for a sequel. I enjoyed reading The Lives of Tao a lot and I'm looking forward to the sequel - assuming he's writing one. This is a great story that touches on a lot of familiar concepts of science fiction and yet the mix of things results in a completely different reality. Thus the book rates 4.5 Genjix agents coming out of nowhere out of a possible 5.